As everyone is aware, electricity was invented in the early 1900s. In the beginning, many people could not use it as most of them at that time did not have electrical connections for supply of electric power to their residences. Even when it was used, it was only for lighting electric bulbs. Subsequently, heaters and stoves were introduced. Cotton mills and other factories that run on electricity were soon established. Currently, with ever growing demand for electric power, researchers and industrialists began to look for alternative sources of power. Many people may not be aware that Canada occupies number one position in power generation in the world, The United States of America purchases electric power from Canada because of heavy demand in that country. In fact, California is among the states in the US that purchases maximum electricity from Canada. Canada built a hydroelectric power plant in the northern province of Quebec to generate electricity. They were under the impression this power generation plant would produce sufficient power to meet the requirements of future generations as well. With rapid growth of population, Canada constructed three more hydroelectric plants. Hydroelectric power plants convert the potential energy from water into electrical energy. Such plants are suitable where plenty of water is available. Dams are constructed over rivers to stop the flow of water and form a reservoir. The reservoir stores the water flowing down the river. This water at a height is rerouted to turn turbines to generate electricity. When power plants are built the entire area is submerged as the level of water has to be raised. While people in some parts of the world have not even heard of electricity, some others have surplus power. There are also several countries that are facing acute shortage of electric power. Apart from hydro-power, there are several other alternative sources of electricity, such as solar energy harnessed from radiant light and heat from the sun, wind energy and electric power from waves. 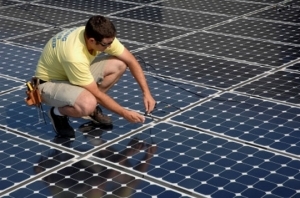 Solar power electric generation depends on solar cells or Photovoltaic (PV) cells. Photovoltaic cells are normally silicon-based units that absorb sunlight. A number of solar cells are assembled to build solar panels. Several solar panels are combined and interconnected as one piece of equipment for higher power generation. Energy from the sun stimulates the electrons in solar cells to generate electricity. The solar power produced is in the form of Direct Current (DC). However, Direct Current is not useful in that form for all common purposes such as lighting, heating and operating various equipment and therefore, it is converted into Alternating Current (AC) with the help of an inventor. Alternating current is normally at 120V. Most appliances can be operated at this voltage. Solar energy can also be utilized for heating at home or for swimming pool using ‘Solar Thermal Technologies’, also called Active Solar Systems. In solar thermal technology, solar radiation is converted into heat and it involves the usage of pumps or fans for active transfer of heat either for storage or distribution directly for use. The most important part of an active solar system is the ‘solar collector’. The purpose of a solar collector is to absorb the radiant energy from the sun and convert it into compatible heat. Different varieties of collectors are available for conversion of solar radiation, classified based on the type of application and temperature requirements. Unpolished metal or plastic flat plate collectors are employed where high temperatures are not required, as for instance for heating swimming pools at residences and for heating air for ventilation in commercial and industrial buildings. Polished flat plates and vacuum tube collectors are utilized for medium range temperature needs, such as for hot water at residences, space heating and cooling the premises. ‘Concentrating collector’ is another type that centers the sunlight on a much smaller area. These collectors are used for applications where higher temperatures are required, as for example, in industrial process heating, absorption cooling and comprehensive solar thermal applications to produce steam for power generation. One way of effecting savings in day-to-day life is to install a solar panel system at home. This will not only reduce expenses on electricity but also contribute to the environment by generating pollution-free solar energy.